Learn Local. Play Local. : Migration to Reconciliation Ecology. Duct Tape to Michelangelo. Learn Local. Play Local. : Hamantaschen to Butter. Neon to Book History. 5 Community-Based Educational Highlights: Libraries to Museums. President’s Day to Black History Month. Tracking to Photography. Braille to Pop Icons. Creative-Free Play to Collaborative Consumption. These are just a few of the community-based learning highlights we’re featuring this week. Peruse our list below and make plans to get out into your community and learn while you play! Featured seasonal highlight this week: Presidents’ Day celebrates the life and work of George Washington. It comes every year on the third Monday of February. Presidents’ Day is a chance to explore the tenets of democracy and civil freedoms. Throughout the January/February Seasons edition of Learning Ahead, the power of voice is a strong and present theme. Democracy, as FDR emphasizes in his four freedoms speech, rests on the freedom of speech, the ability to voice your thoughts and speak your mind. At the heart of the freedom of speech and expression is the freedom to use words, story, narrative, and voice to share ideas. Some of the greatest literature has been used as a vehicle to voice an ethical philosophy or to act on behalf of social justice. The shared dialogue between author and reader through the written word also depends on the freedom to read. Literature and the power of voice is a shared exchange in which ideas are spoken or written to be heard and read. ♦ Download our Jan/Feb edition of Learning Ahead: Cultural Itinerary for Western Massachusetts for embedded learning opportunities found in cultural resources that exist within the geography, history, and cultural traditions of Western Massachusetts that support learning through the lens of Presidents’ Day. 30 Community-Based Educational Highlights: Chinese New Year to National Hearth Month. Culture Studies to Anatomy. Creative-free play to living history. Pilobolus to Shakespeare. Comics to pastels. These are just a few of the community-based learning highlights we’re featuring this week. Peruse our list and make plans to get out into your community and learn while you play! Valentine’s Day is next week, so think about this… How has the Valentine card industry changed over the years? In addition to participating in the Hilltown Families annual Handmade Valentine Swap, what are other non-commercial ways you can celebrate Valentine’s Day with friends and neighbors? How can the giving of a handmade valentine be an expression of kindness? When was the last time you sat down to write a letter on paper? Where did that paper come from? How did the manufacturing of that paper impact the community and environment from which it originated? Did you know… The American valentine industry was started during the mid-19th century by Esther Howland, an Mt. Holyoke graduate, and Worcester native? Through her father’s paper company, she sold her first valentines in 1848 and within a few years was able to begin her own business, the New England Valentine Company. ♦ Download our Jan/Feb edition of Learning Ahead: Cultural Itinerary for Western Massachusetts for embedded learning opportunities found in cultural resources that exist within the geography, history, and cultural traditions of Western Massachusetts that support learning through the lens of Valentine’s Day. Mobile Art Boxes will be blooming in Florence again this spring. These wonderful storage containers/pop-up galleries are part of the village-wide festivities that are happening as part of the 5th Florence Night Out, Friday, May 6, 2016. Florence Night out is a fun, free event that celebrates community through creativity. Starting at 3pm Florence will be hopping with art shows and open houses, an outdoor craft market and walking tours, special food and music all over town. Florence Night Out 2016 officially ends at 8pm but music events continue into the night. Art is a broad term, referring of course to the visual arts but also to music, film, storytelling, theater, and other forms of human expression. The subject of art can be an interesting pathway into philosophical discussions, since opinions on the definition and value of art vary across individuals, Oscar Wilde once said that, “all art is useless,” possibly meaning that the value of art lies in the object itself, not in how it is “used.” The process of making art, however, can have many practical uses. Creating art, whether you are a professional artist or you are just doodling to pass the time, has therapeutic benefits. Where art is located or performed may influence the way we think about it. Artwork preserved in a temperature-controlled gallery, for example, may affect viewers differently than land art or sculpture. Land art is a medium in which installations are made from natural elements of nature such as soil, rock, leaves, branches, water, etc, and left in that natural environment. As opposed to gallery artwork, land art is meant to be changed over time by weather and environmental events. 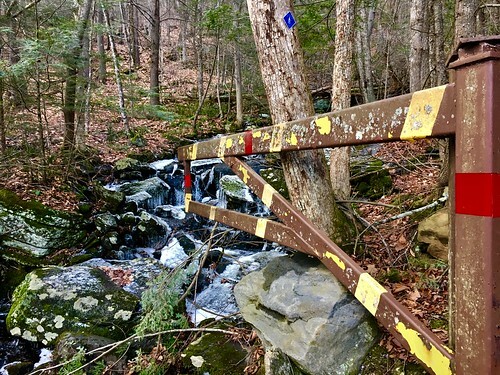 Land art draws connections between order in nature, and the organization which humans impose upon nature, as these elements blend over time. Gallery art is sought out intentionally, while land art can be stumbled upon by accident. Hilltown Families: Your Back-to-School Resource, All Year Long! During the summer months, most children have enjoyed following their interests through outdoor play, reading books they have selected, day-trips with their family, and adventures out in their community. Once late August and early September roll around however, these carefree months of following their own interests and daily rhythms turn towards more organized learning experiences; and for many, the excitement starts to build as families become involved in back-to-school preparations. Maybe this school year will be your child’s first time away from home, or your child is mentally preparing for middle school, or this is their final year in high school… whatever the case, back-to-school can be an exciting time of year for most. Support Hilltown Families During Valley Gives! This month, Hilltown Families will be entering our 10th year! We will also be participating in our 1st ever Annual Appeal through Valley Gives this Wednesday, December 10th! Your tax deductible donation to Hilltown Families during Valley Gives will help us continue to support community building and community learning initiatives throughout western MA! For nearly a decade, Hilltown Families has been working towards creating resilient and sustainable communities by developing and strengthening a sense of place in our children and citizens through community-based education and engagement. In this TEDx Talk, “Supporting Education Through Community Engagement,” Hilltown Families Founder, Sienna Wildfield, shares her story on why feeling connected to where you live matters, and how community-based education and community-service learning can help grow active citizens who care about where they live. Part of our mission includes connecting, creating and collaborating in service-based learning opportunities for families in Western MA. Hilltown Families’ Family Community Service Events are one of our signature events that accomplishes this mission. We have been able to deliver over 1,500 hours of community service through service-based learning with our yearly Family Community Service Events and collaborations with local businesses and non-profit organizations! Volunteering as a family has so many benefits for children, parents, families and the community… yet families are so very busy that it can be difficult to find the time to volunteer together, or to identify ways to support causes and organizations they care about. Hilltown Families’ Family Community Service Events offer a bridge between families and service organizations in our region, bringing our community together in the spirit of volunteerism and collaboration to amplify the work of these organizations while supporting service-based learning and the value of giving back to our community. Local businesses and community institutions love Hilltown Families just as much as our community members! Every day we make connections between the embedded learning & community building opportunities they offer and ways our community can engage with them to support their interests and education. We want our donors to be able to share our local community-based educational resource with your friends, family & community members too. During Valley Gives Day we will be partnering with local businesses and community institutions, like Historic Deerfield, Amherst Cinema and A2Z Science Learning Center, to offer Premiums to our donors to share with others! We will be offering museum passes, movie tickets, gift certificates, music and more to our donors, encouraging you to “Pay it Forward” by gifting awarded Premiums to another. Not only will you feel good about supporting Hilltown Families, but you will also feel good when you share a Random Act of Kindness with another by gifting them the opportunity to engage in our community in a way that supports their interests and education too! If you own a local business or are involved with a community organization and would like to add a gift to our pot of Premiums, encouraging giving as a Random Acts of Kindness following Valley Gives, contact Sienna to make arrangements. Why through Valley Gives? 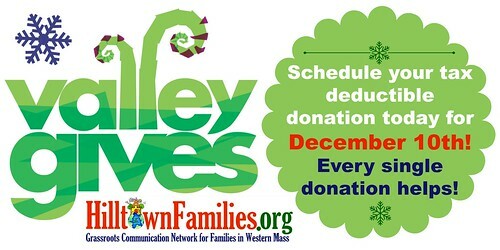 Valley Gives is a collaboration of non-profits throughout western Massachusetts working together to engage 20,000 donors in a single 24-hour day of giving on December 10th. By scheduling your tax deductible donation to Hilltown Families through Valley Gives you too become part of this collaborative effort while amplifying your donation with bonuses and prizes given out by the Community Foundation of Western Massachusetts to participating non-profit organizations. Valley Gives offers big prizes and bonuses for the highest number of new and individual donors. Every tax deductible donation made to Hilltown Families through Valley Gives counts! Can only give $10? We need your donation and Valley Gives boost your donation & support! Community Foundation of Western Massachusetts’ Meet Your Match Bonus is one way you can help us raise over $7,500 on December 10th This is a special competition only for nonprofits that secure matches for Valley Gives Day. Bonus awards will be announced at the end of the day and will be chosen randomly. Community Foundation of Western Massachusetts will award $2,500 to 25 randomly selected nonprofits that meet their matches. Minimum match must be $2,500. If you’re a BIG BIG fan of Hilltown Families and can support us with a tax deductible donation of $500 or more, your donation can be pooled together with other supporters to create a matching grant of $2,500. Please email Rick Feldman or Sienna Wildfield to make arrangements prior to Valley Gives Day. Join our Virtual Street Team! Are you already a fan of Hilltown Families? Join our Virtual Street Team!!! Get social with us and share Hilltown Families on Facebook, Twitter, Pinterest, Instagram, LinkedIn, email and your blogs! As we get closer to December 10th we’ll be asking our virtual Street Team to rally for Hilltown Families, inviting friend, fans and family to support Hilltown Families with a donation during Valley Gives Day. To get started, connect with us through our various social media channels. Then get busy Liking, Sharing, Tweeting, and Pinning our updates, letting those in your own social networks know why you support Hilltown Families and your plans to make a donation of any size on December 10th. The Pittsfield Resilience Circle is organizing the Berkshires’ first ever Repair Café. It will be held in Pittsfield on Saturday, Jan. 19 from 1 to 5 p.m. in the St. Stephen’s Church basement at 67 East St. The event is entirely free. [The Repair Café] involves people in the community giving to other people in the community, making needed repairs of all kinds. Various repair persons will be available to fix small appliances, clothing and other fabric items, bicycles, toys, small furniture items, computers, and so on. Anyone with a broken item in need of repair may bring it to the Repair Café between 1 and 5 p.m. on Saturday, January 19th. We will fix as many articles as we can during that time. We’re also offering free refreshments for those waiting in line. The Pittsfield Resilience Circle could use more volunteers for the Repair Cafe. Persons with experience in any kind of repair craft or who would like to provide general help, please call Tom Harter at 413-212-8589 or email Janet Henderson at jmh227@hotmail.com. The Repair Café is looking for more sponsors (those who donate $20 or more). We are thankful for our sponsors, including the Berkshire Environmental Action Team (BEAT), who is contributing both money and time! By holding a Repair Café, the Pittsfield Resilience Circle wants to help reduce waste, promote repair skills, teach us all to be more self-sufficient, have fun, come together in a non-consumerist way, forge bonds of friendship through mutual dependency, and make Pittsfield a better place to live. Members of the Pittsfield Resilience Circle meet twice a month to learn together and become better friends through doing things for and with each other. The Resilience Circle is based on information available at localcircles.org. The group also has an informal Gift Circle. Information about Gift Circles can be found on the OpenCollaboration’s Blog.